The UK remains the number one destination for foreign direct investment (FDI) in Europe, according to EY’s latest UK Attractiveness Survey. However, there was a notable decline in sentiment from foreign investors toward the UK as a place to invest in the future, which has allowed Germany and France in particular to gain ground. 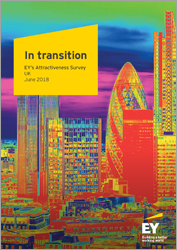 The UK’s economy is in a state of transition, according to EY, with Brexit and ongoing technological changes impacting investments across sectors, as well as project types and sizes. In 2017, the UK attracted 6 percent more FDI projects compared with 2016, with the number of projects rising to 1205 from 1138. There was also a 6 percent boost in the number of FDI-related jobs created, to 50,196. However, the UK’s traditional FDI targeted sectors, financial services and business services, recorded significant declines last years. Projects in the financial services space fell by 26 percent, despite the sector recording growth across Europe – the total number across the EU rose by 13 percent. The business services sector saw a decline of 10 percent as the European market recorded growth. Last year also saw the UK fall to second place behind Germany in attracting business services projects, as UK projects from this sector fell and Germany’s increased. EY also noted a “marked increase” in UK outbound investment in 2017, with the trend particularly evident in the financial and business services sectors. The total number of outbound investments was 464, up 35 percent on the previous year’s total of 343; 110 of those investments went to Germany, and 79 to France. Business services outbound projects rose from 117 to 125, up 7 percent. For the first time since EY began reporting on investment attractiveness, London is no longer the most attractive city for FDI in Europe. That honour goes to Paris, thanks to the burgeoning impact of Brexit and the so-called ‘Macron effect’. 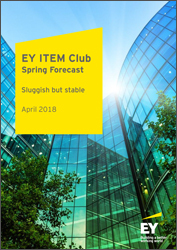 The UK is expected to see GDP growth of 1.6 percent in 2018, according to the latest EY ITEM Club Spring Forecast. Continuing 2017’s "uninspiring" growth levels, the country’s 2018 forecast has actually been slightly downgraded from 1.7 percent. Q1 GDP figures are expected to show growth of just 0.2 -0.3 percent, primarily due to the severe weather that hit the country at the end of February and beginning of March. The final quarter of 2017 saw 0.4 percent year-on-year growth. EY expects the second quarter of 2018 to see quarter-on-quarter growth of 0.5 percent. Consumers are expected to experience a ‘double positive’ for real income growth moving forward, with inflation set to fall and stronger pay growth anticipated. Household income growth is expected to reach 1.2 percent in 2018, rising to 1.4 percent in 2019, a marked improvement on 2017’s 0.2 percent increase. However, the income growth is not expected to translate into an improvement on 2017’s 1.7 percent rise in consumer spending. The economic uncertainty caused by the ongoing Brexit negotiations should be alleviated shortly, and business investments should benefit as a result, according to the report. Yet due to the weak growth recorded in the second half of 2017, business investment in the UK is only expected to grow by 1.7 percent in 2018 before picking up to 2.7 percent in 2019. However, Brexit is not the only cloud on the horizon. “Potentially adverse developments in trade policies and geopolitics could hit trade flows”, according to Mark Gregory, EY’s chief economist, UK. Though a resurgent global economy bolstered the UK’s economy, geopolitical headwinds could still curtail growth in the coming months. Automation is coming. Recent reports have suggested that millions of people around the world will be impacted by the wave of automation and other new technologies which are currently emerging. 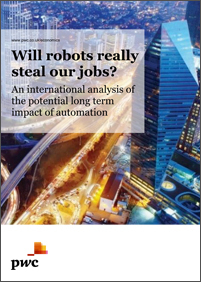 A new report from PwC – 'Will robots really steal our jobs?' – suggests that while the financial services industry in particular could be vulnerable to automation in the short term, a variety of industries, including those in the transport space, are much more vulnerable in the longer term in the UK. Less well educated workers, too, will be increasingly susceptible to replacement. Female workers are also more likely to be replaced than their male counterparts. PwC has identified three distinct waves of automation which will impact the global economy up to 2030: the algorithm wave, the augmentation wave and the autonomy wave. The algorithm wave is already underway and will last until the early 2020s. It involves automating structured data analysis and simple digital tasks, such as credit scoring. This wave could see just 2-3 percent of UK employees affected – 4 percent of women and 1 percent of men. The augmentation wave, which centres on the automation of repeatable tasks and exchanging information, as well as further development of aerial drones, robots in warehouses and semi-autonomous vehicles, could impact 20 percent of UK jobs – 23 percent of women and 17 percent of men. This wave will last until the late 2020s. The third wave, the autonomy wave, suggests that AI will have developed to the point that it will be able to analyse data from multiple sources, make decisions and take physical actions with little or no human input. This wave will last until the mid 2030s and could affect 30 percent of the workforce – 26 percent of women and 34 percent of men. Automation is expected to be a boon for the economy, however. PwC believes it could contribute as much as 10 percent to UK GDP and 14 percent to global GDP by 2030. Report: Will robots really steal our jobs? The International Monetary Fund has predicted an upturn in the global economy in its latest World Economic Outlook Update. The global economy is expected to have grown by 3.7 percent in 2017, 0.1 percent faster than the IMF projected last autumn and half a percent higher than in 2016. The pickup in growth has been broad based, with notable upside surprises in Europe and Asia. The report says 120 economies – both developed and emerging – accounting for three-quarters of global economic activity, saw an improvement in 2017. Looking ahead, recent reforms to the US tax regime will also have a positive impact on global growth over the next two years, the IMF has suggested. “The effect on US growth is estimated to be positive through 2020, cumulating to 1.2 percent through that year, with a range of uncertainty around this central scenario,” the report noted. Yet, the IMF argued that the impact of the reforms will not be long lasting “due to the temporary nature of some of its provisions, the tax policy package is projected to lower growth for a few years from 2022 onwards". Global growth forecasts for 2018 and 2019 have been revised upward by 0.2 percent to 3.9 percent. Advanced economies, where growth is now expected to exceed 2 percent in 2018 and 2019, will be responsible for the majority of the growth. The eurozone is also expected to see improved growth. The IMF has revised its predicted growth rates for Germany, Italy and the Netherlands, based on improved momentum in domestic demand and higher external demand. However, Spain, which has been performing admirably in recent years, has seen its growth forecast for 2018 revised down, in light of the perceived effect that increased political uncertainty will have on confidence and demand. UK growth will be 1.5 percent in 2018 and 2019. In October, the IMF reported that the UK’s estimated growth in 2019 would be 1.6 percent, however Brexit and its potential implications for trade barriers and regulatory realignment may dampen UK growth moving forward. Of the G7 nations, the UK s projected to outgrow Italy and Japan over the next two years, but lag behind the rest of the group. Emerging and developing Asia will see growth of around 6.5 percent in 2018 and 6.6 in 2019, the IMF estimates. Emerging and developing Europe will see growth of 5.3 percent in 2018 and 2019. The pace of growth of the global economy has surpassed earlier estimations with a marked improvement under way across nearly all the world’s major economies, according to the International Monetary Fund’s World Economic Outlook report. In 2015, the global economy grew a disappointing 3.2 percent, but the world is on track for 3.6 percent growth this year and 3.7 percent next year, according to the IMF. It upgraded its growth forecast by 0.1 percent for this year and next from the last full Economic Outlook in April and the update to its forecasts in July. However, there are some black clouds on the horizon. The UK’s growth forecast has been cut by 0.3 points to 1.7 percent since April as a result of the consumer-led slowdown in activity in the first half of the year, caused by the pound’s depreciation. The IMF has also scaled back the expected growth predicted for the US economy due to uncertainty surrounding president Trump’s ability to institute his proposed tax cuts. As a result, though the IMF still expects the US economy to grow this year, the speed of that growth will be reduced. The IMF forecasts that the economy will see 2.2 percent growth in 2017 and 2.3 percent in 2018; in April it projected 2.3 percent growth this year and 2.5 percent in 2018. “The downward revision relative to April forecasts reflects a major correction in U.S. fiscal policy assumptions,” the IMF wrote in its latest World Economic Outlook report. Because of “significant policy uncertainty,” the IMF felt it could not count on Congress and the president passing lower taxes. Regardless of uncertainty in the US and other regions, the global economy is still performing above expectations. The pace of its recovery from the global financial crisis of the 2000s is faster than anticipated. "The picture is very different from early last year, when the world economy faced faltering growth and financial market turbulence. We see an accelerating cyclical upswing boosting Europe, China, Japan, and the United States, as well as emerging Asia," Maurice Obstfeld, an economic counsellor and director of research at the IMF, wrote in a blog post accompanying the report. "The current global acceleration is also notable because it is broad-based – more so than at any time since the start of this decade." All 15 countries the IMF tracks individually are expected to grow in 2017 and 2018, with China and India set to lead the pack. China is expected to regain the fastest-growing nation crown with 6.8 percent expansion this year, slightly ahead of India's 6.7 percent. However, India is forecast to take the lead in 2018.